Laboratories continue to play an important role in disease control and prevention programmes through the provision of timely and accurate information for use in and disease surveillance patient management. In line with Zambart’s mission and objectives, the Zambart Laboratory Unit is organised to directly assist the organisation in fulfilling its mandate to influence public health policy through research and improving health research capacity in Zambia. The ZAMBART Central Laboratory (ZCL) is located at ZAMBART House on the UNZA School of Medicine campus in Ridgeway, Lusaka. The role of the laboratory is to support the conduct of research studies performed by ZAMBART and its many partners (ZAMSTAR TB Prevalence Survey, ZAMPACT, DARTZ, TBM, PopART/HPTN 071, etc.). The laboratory staff assist in preparing standard operating procedures (SOPs) for the collection, transport, storage and testing of specimens (blood, sputum, CSF, urine, etc. ), as well as performing a wide variety of tests (HIV Ag/Ab, HSV2 Ab, HbA1c, CD4, TB culture, Gene Xpert, LAM, Hain LPA, DST, smear microscopy, etc.). In addition, laboratory staff provide advice and guidance to the Zambian Ministry of Health and other organizations working in Zambia and around the world. The ZPCL facilities consist of three buildings, all supported by an 88kVa diesel generator: the Main Laboratory, TB Laboratory, and the Specimen Repository. 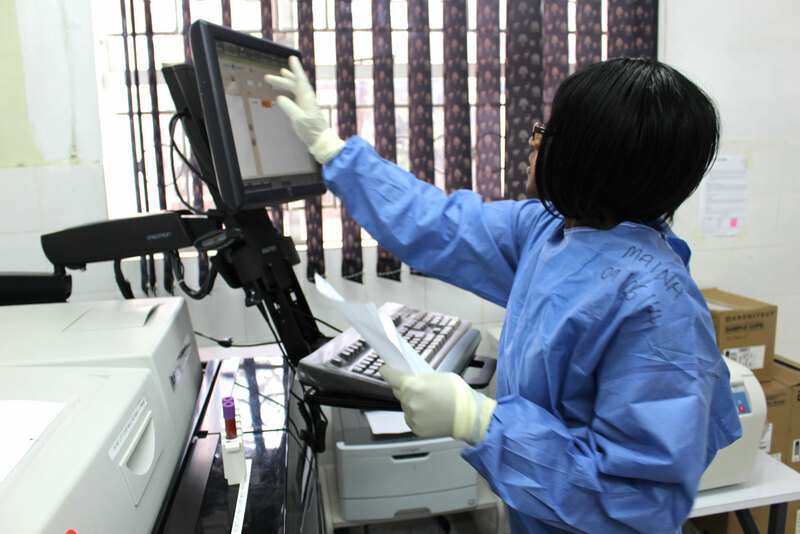 Also in Lusaka, at the Kanyama Health Center, we maintain Gene Xpert instruments for rapid TB diagnosis. As part of the PopART/HPTN 071 Study, Community HIV Care Providers (CHiPs ) conducting door-to-door counseling and testing in the community will collect sputum for Xpert testing from Intervention participants reporting symptoms of TB. Outside of Lusaka, for the PopART/HPTN 071 Study – Population Cohort (PC), we have established five Regional Plasma Processing Laboratories at the following sites: Kitwe Central Hospital, Arthur Davison Children’s Hospital in Ndola, Kabwe General Hospital (in our BSL3 containerized TB laboratory), Choma General Hospital, and Livingstone General Hospital (in our BSL3 containerized TB laboratory). These laboratories are equipped with centrifuges, -80C freezers, Gene Xpert instruments for TB testing, computers, barcode label printers and scanners, and battery back-up power systems. The laboratories receive annual blood specimens from the 22,500 PC participants residing in the 9 PopART communities outside of Lusaka. The blood is centrifuged and the plasma is aliquotted into four tubes and stored in -80C freezers within 8 hours of collection. Every four to six weeks, the four aliquots of frozen plasma are transported to Lusaka for storage in the Specimen Repository at ZPCL.